I have been lucky enough to see succulent plants in many habitats. Often I think how well they look, pristine condition, unmarked, good enough for the showbench even. In contrast, the plants of Pleiospilos compactus, a mesemb I discovered on a rocky hillside in the Karoo National Park in South Africa were the opposite. My printed guide for the Nature Trail indicated the area I should be searching but it was not until I saw the seed capsules that I realised I was looking at quite mature plants. However they were barely alive. A combination of long term and seasonal drought was threatening to extinguish the species from the hillside. If the rains come then these plants may recover; there will in any case be a good seed reserve in the ground. My second picture shows a seed raised plant for comparison. This is about twenty years old and flowers every year. In a normal year this flowers in November. 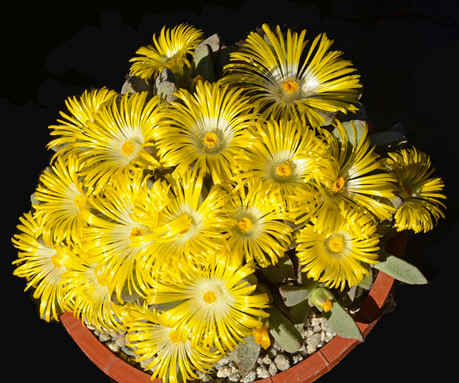 Light levels are low but the plant requires only daylight to open its glowing yellow blooms in the afternoon. Having written that I notice that as the flowers mature they then commence opening in the late morning. I would not get any points for this cultivated plant being ‘true to nature’ but I know which I prefer! 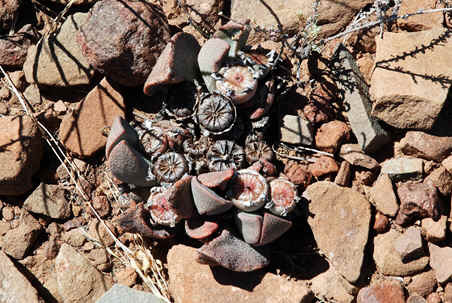 Top left: Pleiospilos compactus in habitat in the Karoo National Park. Left: Cultivated Pleiospilos compactus in a 160 mm round pan.